Cast: Domoto Tsuyoshi, Hirosue Ryoko, Oguri Shun, Imai Tsubasa and Ikewaki Chizuru. 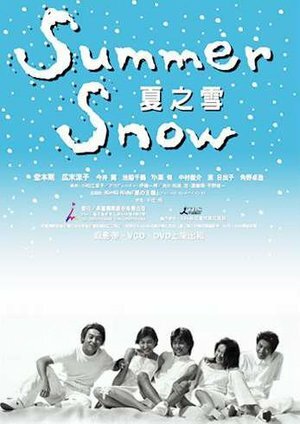 After the death of his parents, Shinoda Natsuo (Domoto Tsuyoshi) had to take care of his two younger siblings; the half deaf brother Jun (Oguri Shun) and sister Chika (Ikewaki Chizuru), who is secretly dating Juns friend Suetsugu Hiroto (Imai Tsubasa). While running a bicycle shop, he also is the head and busybody of the family. By being simple minded and an easy-going person, he one day meets Katase Yuki, an OL who has never had a job, due to her heart illness. This drama is heart warming, and heartbreaking at the same time. I enjoyed watching this family, even wanted to be part of it. Domoto Tsuyoshis character was pretty amazing; a big brother willing to take tons of responsibility on his shoulders and not say a pip about it. I like that he starts to act like a dad, but then, probably realises it himself that, he becomes the protective brother. The characters individually are superb; I mean they all have something memorable, and interesting about them; being deaf and wating to achive a dream, teenage pregnancy, having a deadly illness and lacking responsibility. Though the ending was a bit messed up, meaning confusing, I did kind of expect the ending, so I actually did not like it. But it's the type of endings that I love, unique and tough to deal with. Final words, watch it if you like good scripts and unique stories.